A few weeks ago I was kindly invited to the Voucher Codes/Most Wanted Blogger Swap Shop (I blogged about the event here). Amidst cocktails, cupcakes and photo booth fun, we rifled through clothes and swapped unloved items for new clothes that other bloggers had brought along. 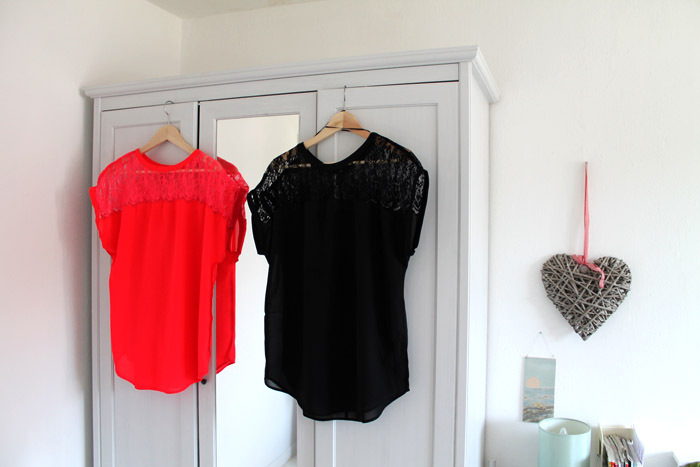 I picked up some real treats, but my star find was a black, lace panelled top from H&M. Not only because is it flippin’ lovely, but also because it was the same top I was wearing at the time (not really a coincidence, I wear it all the time) in another colourway, and still had its tag on. Perfect! I’d bought the coral colour from H&M a few weeks ago, thinking it was really summer-y and unique. I adore the black colour, but with the lace-panelling and sheer material I couldn’t help feeling it was inching towards ‘evening-wear’ and being as these days I’m most likely to spend my evenings blogging, drinking tea or catching up on The Valleys, I wanted to find a way to make it a bit more casual and fit with the rest of my wardrobe. As if my magic, in stepped Most Wanted (the Voucher Codes blog/news site) with their Swap Shop Styling Challenge. The aim of the challenge was to style the items swapped at the Swap Shop by adding other items from our wardrobes, and with the help of a £35 budget to add some new accessories or clothing to the mix. I actually spent the remaining £5 on a different neon necklace from eBay but it’s coming from China and six weeks later, it hasn’t arrived yet, annoying!